Growing preference towards naturally sourced industrial products will considerably drive the epoxidized soy oil (ESBO) market worldwide, as more companies providing bio-based ingredients and chemicals have cropping up recently. Rising focus by governments on restricting the use of harmful chemicals and ingredients in the manufacturing, agricultural and food & beverages sectors has propelled efforts to produce vegetable-derived oil. The ESBO industry has prospered in recent years owing to the product’s increased usage as plasticizer as well as in fuel additives. A key application of ESBO, which could help escalate the industry growth, is the production of functional fluids and lubricants that are being utilized across various end-use segments globally. Use of fluids in manufacturing process of base metals and the fabrication of metal products like auto panes and structural steel, along with the massive demand for automotive lubricant could extremely proliferate the epoxidized soy oil market. Increasing demand for packaged food and beverage products has offered tremendous growth opportunities for businesses associated with packaging, including the coating of cans in which the product is stored. Instructions by food regulators around the globe to limit the phthalate plasticizers has paved the way for the epoxidized soy oil market to penetrate into the can coatings segment. Coatings consisting of ESBOs help to prevent corrosion of the containers along with ensuring the food is not contaminated with any dissolved metals. Rapidly surging consumption of canned food and beverages, particularly in the Asia-Pacific (APAC) region, has facilitated the expansion of the regional ESBO market, which can be further thrusted by the consumption of fuel and functional fluids in automotive and industrial sectors. Effective coatings on cans and other type of protective packaging helps to lengthen the shelf life of food and allows producers to transport and store products throughout an entire region. Asia consists of numerous countries where agriculture covers a large amount of land, for instance India which has nearly 395 million acres of arable land. China is reported to have the largest agricultural output in the world and is also a major consumer for the global epoxidized soy oil industry. The two most populated countries in the world could turn out to be a significant target for packaged food products, inadvertently supplementing the coatings industry. Gradually rising economy in most Asian countries has altered the lifestyle of the working population and generated a demand for canned food products that are affordable, quick and easy to eat. Presence of innumerable food processing businesses which export food products to Europe, U.S. and the Middle East will sustain the consumption of packaging materials that preserve food and beverages. 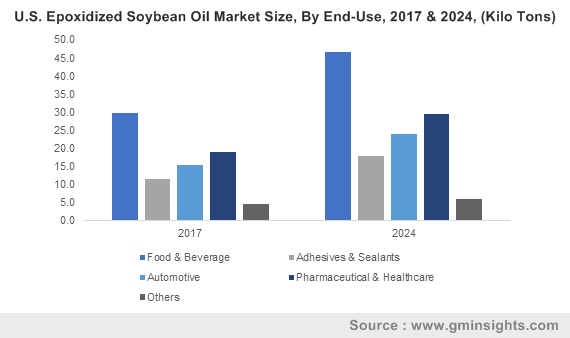 Estimates indicate that by 2020 itself, the packaged food and drink industry could be valued over US$160 billion in Southeast Asia, signifying a lucrative future for the APAC epoxidized soy oil market. Also, with countries realizing the potential of soybean derived chemicals in different sectors, its production can be expected to witness enormous growth commercially. In essence, the primary purpose of a functional fluid is reducing friction and help in preventing wear and tear of working parts and components. As a natural substitute for mineral oils, ESBO can be utilized as an ingredient in functional fluids such as transmission fluids, metal working fluids in fabrication of auto body panels, among other uses. APAC has become one of the largest market for automobiles over the last two decades due to the introduction of affordable cars and fast-paced industrial development. In 2016, China had produced about 28 million motor vehicles, capturing nearly 30% of the of the global market share. Expanding auto manufacturing sector will further fuel the evolution of the ESBO industry as the need for natural fuel additives is propagated all over the region. APAC is home to manufacturing facilities of automakers such as Suzuki, Hyundai, Volkswagen, Kia and Toyota which see millions of their vehicles being sold worldwide. It is anticipated that the epoxidized soy oil market size from fuel additive segment will record considerable growth rate in the next few years globally, mostly due to the increased efficiency and vehicle performance the ingredient helps to achieve. All in all, accelerating demand for canned food & beverages along with the need for cleaner, more efficient fuel and automotive fluids will propel the APAC ESBO market valuation over the forecast timespan. The global competitive hierarchy comprises of key players including Arkema, CHS Inc, INBRA, Valtris, Zhejiang Jiaao Enprotech Lt and Makwell. Consistent innovations in chemical production and oil extraction technology, in addition to the development of new varieties of soybean will greatly strengthen the epoxidized soy oil industry.